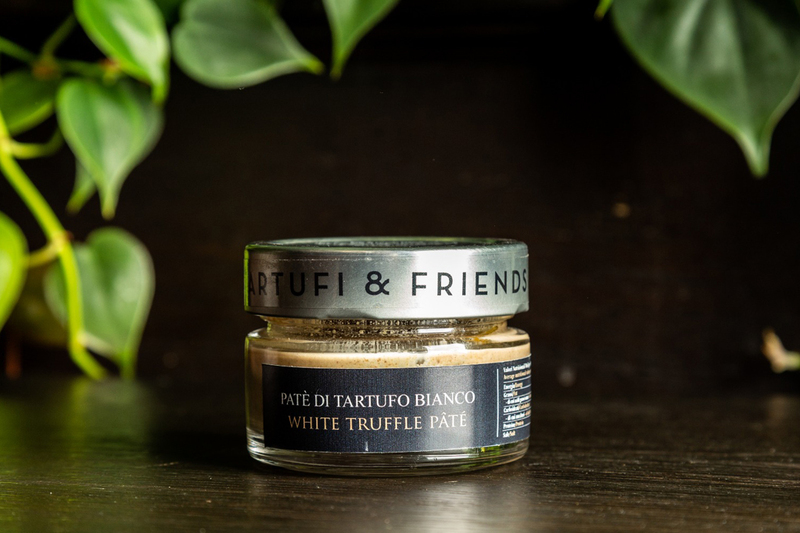 Tartufi and Friends | White truffle patè: 98% truffle, 100% taste! 14 Nov White truffle patè: 98% truffle, 100% taste! These are the ingredients of our white truffle pâté: Italian white truffle (Tuber Magnatum Pico) 98%, peanut oil, salt, aroma. Perfect to enjoy the fantastic taste of the best truffles without the concern of conservation. White truffle is available for a few months a year, but our patè allows you to stock up and have it ready for the whole year! It is perfect for croutons and bruschetta for an excellent appetizer or aperitif, or on white pizza, why not? With its magic it can however be used to give irresistible scent and flavor to each recipe. But always remember to follow the most precious advice when it comes to white truffle: it does not go very well with already very tasty foods that cover and confuse its peculiar organoleptic characteristics. You can buy white truffle pâté at all our restaurants or conveniently online on our website, along with all other truffle products, strictly homemade and with the same quality that you can find by visiting us at lunch or dinner . Cremes, sauces, vinegar, honey, liquors, butter. Fill your kitchen with magic!